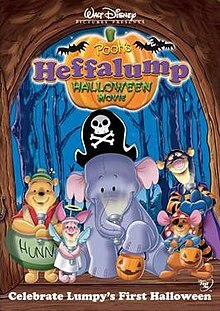 Pooh's Heffalump Halloween Movie is a 2005 American animated direct-to-video film produced by DisneyToon Studios, featuring the characters from Winnie the Pooh franchise and the sequel to Pooh's Heffalump Movie. This is voice actor John Fiedler's final appearance as Piglet, as he died three months before release. Travis Oates (who would eventually become Piglet's current voice actor) replaces Fiedler in some scenes. It was followed by a television film produced by Walt Disney Television Animation and Polygon Pictures, Pooh's Super Sleuth Christmas Movie, released on November 20, 2007, an animated feature served as the episodes of the television series My Friends Tigger & Pooh. It is Lumpy's first Halloween with Winnie the Pooh, Roo, and their friends in the Hundred Acre Wood. The group discusses their plans for Halloween and for their first night of trick-or-treating. Tigger, alarmed by a mysterious figure he spotted earlier in the woods, warns his friends about the dreaded Gobloon, a monster that comes out every Halloween to catch residents of the Hundred Acre Wood and turn them into "jaggedy lanterns" if he catches them. But Tigger tells them that if the Gobloon is captured first, it will grant its captors one wish. After Pooh eats all of Rabbit's trick-or-treat candy, Roo and Lumpy set out to capture the Gobloon to wish for more candy. When Roo and Lumpy reach the supposed Gobloon's lair, Lumpy loses his courage to catch the Gobloon. So Roo tells him the story from Boo to You Too! Winnie the Pooh, when Piglet was afraid to go trick-or-treating, but gained his courage. Roo believes that if Piglet can conquer his fears, then so can Lumpy. An inspired Lumpy helps Roo set a trap for the Gobloon, but the two end up fleeing once they think the Gobloon is returning. After encountering and fleeing from the mysterious figure, Lumpy gets separated from Roo and ends up stuck in the trap they had set for the Gobloon. Lumpy is heartbroken to be alone, as he and Roo had promised to stay together during the adventure. Roo finds a Jack-o'-lantern resembling Lumpy, which makes him think his friend has been caught by the Gobloon and turned into a Jack-o'-lantern. Once back with the others, Roo recruits Pooh, Piglet, Tigger, Eeyore and Rabbit to help him capture the Gobloon and save Lumpy. The group arrives at the trap and believes the Gobloon is trapped, unaware that it is actually Lumpy. Roo wishes to have his friend Lumpy back. Hearing Roo's voice, Lumpy calls for him, but a loud thunder blocks it, prompting him to break his way out of the trap. The group finally goes trick-or-treating, and Kanga, who was the mysterious figure that Tigger mistook for the Gobloon, throws a Halloween party for the friends, complete with Jack-o'-lanterns she had carved in everyone's likenesses. She explains that she must have accidentally dropped Lumpy's Jack-o'-lantern—a mistake that sparked the entire adventure. With Lumpy's first Halloween being successful, everyone from the Hundred Acre Wood enjoys the Halloween party. The film was produced by DisneyToon Studios, and Project Firefly, a start up animation company founded by former Disney Feature Animation Florida employees. ^ Moore, Roger (January 31, 2006). "Drawn to the light". Orlando Sentinel. Tribune Publishing. Retrieved March 6, 2018.